There is persuasive evidence to indicate that the abolition of the mile and the adoption of metric for distance signs and speed limits are on the government’s agenda. 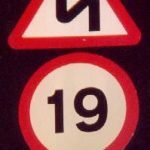 “…no plans to replace imperial signs with metric signs until the majority of drivers have been educated in the metric system…Given that a UK driving licence is valid until the holder reaches 70…it will be some time before the present government considers the need to change our signs” (letter 6/9/00). “Both the present and previous governments have indicated that they have no plans to replace imperial signs with metric signs until the majority of drivers have been educated in the metric system, which is likely to be some time. It is for this reason that we would not consider changing the Regulations to allow the use of metric units on direction signs in the near future” (21/9/00). i) Illegal sign conversion Metric signs are currently illegal in Britain, barred by the 2002 Traffic Signs Regulations and General Directions. 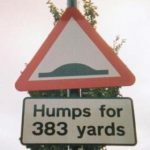 However, for a number of years, a large number of local councils have been using metres in place of yards on road and pedestrian signs; for example, “Speed Humps 20m”, or “Tourist Information 150m”. Until recently, there was no evidence to link these local actions to central government. However, in response to complaints, some councils have recently said that the metric signs are “in line with [the DETR’s] current thinking”. This would tend to suggest that the DETR’s metric agenda is further ahead than what it acknowledges publicly, and that councils that erect illegal metric signage have its tacit approval. In fact, the DETR has stated to at least one local council: “…we will not insist that you remove the signs” (21/9/01). It is not lawful to use signs that show distances in metres or kilometres. This applies to both road traffic signs and pavement signs for pedestrians (although not to signs on private land). It is a legal requirement that signs giving restrictions on traffic width, length and height (eg on approaches to bridges) have imperial units. Dual-marked imperial-metric signs are legal for vehicle height and width restriction signs but not for length restriction signs. For length restriction signs, metric may be used alongside imperial but only on separate, additional signs (in practice, this rarely happens due to the cost of extra signs). “While EU directives permit the retention of imperial units on speed limit and direction signs, the UK has no derogation from the requirement that technical documents use metric units…the guidance in the Traffic Signs Manual on…placing signs [therefore] uses metric units” (3/10/00). iii) Regulatory amendments Illegal installation of metric signs as described in (i) is gradually followed up by changes in the law that legalise what has already happened. 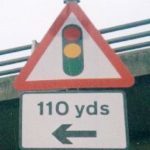 For example, although dual metric-imperial width restriction signs are currently illegal, the DETR says: “We propose to include a width restriction sign combining metric and imperial units when the revised regulations are made” (20/2/01). In other words, local authorities are breaking the law in anticipation that the law will be changed. Moreover, amendments in regulations to permit dual signs also favour metric in terms of prominence. The Traffic Signs Manual requires that metric is placed above the imperial and that the font-size for the whole metre figure is larger. The DETR denies that this is to give metric prominence, saying that it is “for design reasons” (20/2/01). White distance-marker posts along motorways (usually marked with an arrow to indicate the nearest telephone) are placed at intervals of 100 metres. The DETR says this is to “assist maintenance crews to locate their exact position”. The stopping distances appear to be based on round figures in feet – but the equivalent in metres is given first in all instances. 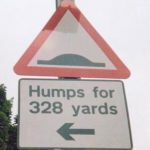 Curiously, yards are not used, even though this is the unit of distance on road signs. The Highway Code makes no reference at all to feet or yards for the description of thinking and braking distances; only metres are used. The Highway Code also states that headlights must be used when the driver cannot see beyond “100m (328ft)”. Government computer systems designed to record road traffic information are to use three digit fields for vehicle speeds. According to an internal government document (reproduced below), “…three boxes have been provided to allow for eventual metrication”. What then must be done? The government’s tactics in achieving metric signs follow the undeclared, slice-by-slice approach seen so many times before with metric conversion. BWMA believes that K-Day is a very real threat and that, if it is to be averted, we have to act now against the current encroachments. By enforcing the current law and purging illegal metric signs, a message be sent to the present and future governments that Britain will NEVER accept the use of kilometres on our roads.Support the resistance by going to “Join the Action” on the contents list to the left (alternatively, click here to join the resistance).